The lifeblood of theatre are the people that make the magic happen on stage. Since its inception, Miracle has benefited from the talents of countless miracle workers: actors, directors, designers, backstage and front of house management personnel, technicians, and volunteers. We have scoured our archives for biographies of all of those who have participated in the Miracle past and present. Some bios, unfortunately, do not exist; some have not been found yet; and some may be lost completely. That all bios are dated according to when last they appeared in a show program or on what we’ve got available. In most cases, only the most recent bio is displayed. No bios have been edited at this posting, though it was tempting. There may also be mistakes! A majority of the bios had to be typed in from old programs. We would be happy to correct and/or update biographical information should that be desirable. Finally, with only one exception (and I won’t say who) all personnel bios have been included–the good, the bad and, shall we say, the other. La vida del teatro esta en la sangre de la gente que hace que la magia suceda en el escenario. 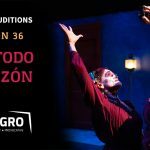 Desde su inicio, el Milagro se ha beneficiado de los talentos de incontables hacedores de milagros: actores, directores, diseñadores, personal del manejo del teatro en la entrada y atrás del escenario, técnicos y voluntarios. Hemos pulido nuestros archivos por las biografías de todos aquellos que han participado en el Milagro en el pasado y presente. Algunas biografías desafortunadamente no existen; otras no hemos encontrado y otras pueden haberse perdido completamente. Que todas las biografías están fechadas de acuerdo a la última aparición en un espectáculo o la que hemos tenido a nuestro alcance. Ninguna biografía ha sido editada desde su envío, aunque hubo la tentación. ¡Puede haber errores! La mayoría de las biografías tuvieron que ser copiadas de viejos programas. Estaremos contentos de corregir o actualizar su información biográfica a su gusto.